Reducing visual clutter such as tangled phone and computer wires can help reduce stress. Free your mind by organizing them using a cable holder or binder clips, and then hide them behind a cork board or large picture frame. Out of sight, out of mind. If your desk is riddled with sticky notes containing scribbled reminders, it may be time to invest in a planner. You can use the note section of the planner to write down passwords that you use on a regular basis and the calendar to jot down your schedule for the day, week, or month. This will help you stay updated on due dates without drowning in post-it-note reminders. Without a nearby trashcan, old receipts, notes, and wrappers can linger in your workspace longer than necessary. 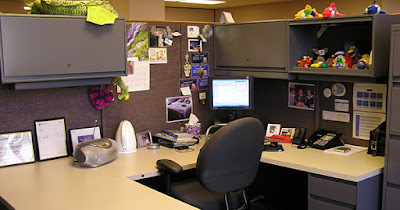 You can easily avoid accumulating this unsightly clutter by keeping a small trash can under your desk for easy access. There is nothing worse than unplugging the wrong cord and accidentally shutting off your computer. Avoid losing hours of work by labeling your cords. You can use a labeler or make your own labels out of colored tape. Just make sure that the labels are easy to remove to avoid damaging company property. Having a place to put all the paper clips, loose change, and spare pens that find their way onto your desk is a great way to decrease the appearance of clutter. We suggest using a transparent jar so that you can keep track of what is inside of it. By using these cubicle organization hacks you are well on your way to a more orderly and productive workday.